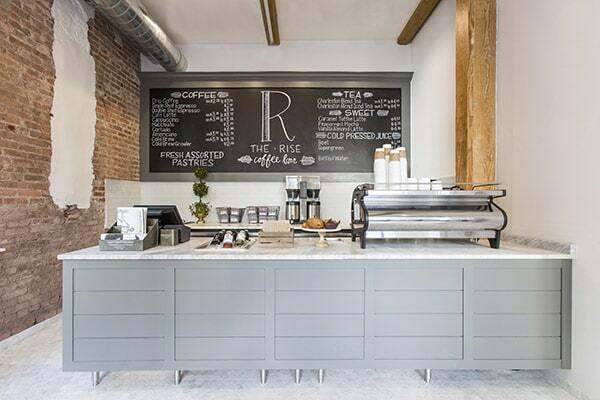 The Rise Coffee Bar at The Restoration Hotel. We’re proud to work with many incredible wholesale partners, not only because they serve our coffee, but because they provide welcoming, energizing spaces for visitors and locals every day. While we get the privilege of collaborating with these retailers on a regular basis, you may not know much about the people and spaces behind your morning brew. Today, we’re excited to share more about our partners at The Rise Coffee Bar, a specialty café located at The Restoration Hotel. 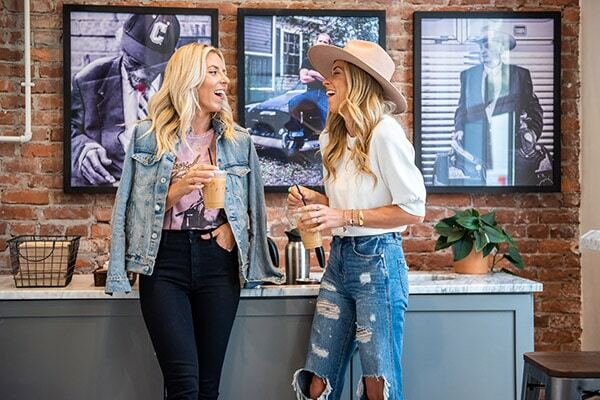 Named “the most Instagram-able coffee shop in Charleston” by Explore Charleston in 2018, the window-filled café brings a bright, modern aesthetic to its historic Wentworth Street surroundings. In addition to juices and house-made pastries, The Rise serves a full coffee menu, including an exclusive specialty blend we developed in partnership with their team. Tell us a bit about The Rise and your team at the café. The Rise is a European style sip & stroll shop situated in The Exchange building of The Restoration. We make all of our pastries and the majority of our syrups in house, and we strive to use small batch, quality ingredients. Our amazing team includes four baristas and our amazing Coffee Shop Manager, Dakota Steiner. What’s something we may not know about your space, menu, or staff? The Restoration is comprised of 5 different buildings, 4 of which date back to the 1800’s (the oldest of which houses The Rise). The exposed beams in The Rise are original, and a keen eye can spot past design elements. I love the charm these elements bring to the space, it reminds us we are a small part of the building’s long history. We also have an adjoining outdoor space located just off the coffee shop with wifi if our guests would rather get some work done with fresh air. What do you enjoy most about running a café inside of a boutique hotel? The mix of guests. We try to create experiences for our hotel guests that allow them to live like a local and immerse themselves in the Charleston community. The Rise does the best job in identifying themselves separately from the hotel. Our Rise regulars include CofC students, businesspeople, King Street retail associates, artists, etc. Our guests can really feel the beat of the city in this small space. We once spotted Alton Brown ordering coffee at The Rise. Who’s the most famous person you’ve served? Alton Brown joins us regularly. As for the others, our guests’ privacy is one of our highest priorities, so you’ll just have to keep an eye peeled! Which drinks are ordered most often? The Rosemary Rise is by far our signature latte – Mr. Brown has been known to indulge in more than one per day. We keep things fresh by featuring a new beverage every month. Why did you decide to work with Springbok Coffee Roasters? When aligning ourselves with brand partners, we look for vendors that have the same mindset on quality products, business practices and service. We are family-owned and we love to support family-owned businesses within our community. You’re located in a bustling part of downtown with lots of visitors! What are some of the funniest or most surprising questions people have asked when they get to the counter? If you haven’t stopped by The Rise at The Restoration Hotel, we highly recommend you pop by for a coffee or signature beverage. The cafe is open Monday-Friday 7am-5pm and Saturday-Sunday 8am-5pm. And if you operate a coffee shop, restaurant, or hotel and are interested in partnering with a specialty roaster, we’d love to chat more about your needs, our extensive services, and bringing as much value to your coffee program as possible. Learn more about our Wholesale Partnerships or join us at an upcoming Coffee Cupping to sample some of our current offerings.